Servicing Private, Corporate or Public Venues with Exceptional Italian Cuisine! Our Mission is to provide Italian foods that match your venue and exceed your taste expectations every time! 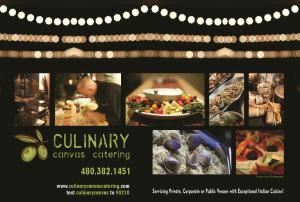 Culinary Canvas Catering has been in the making for years as a family accumulation of Italian heritage sharing good food with great people. We want to make you part of our family by sharing these wonderful recipes the way our friends and family have enjoyed them. To keep updated with events and announcements text "culinarycanvas" to 90210 We provide private, public, and corporate catering services to groups of 10 or more and require a minimum of 3 days notice. Please call to speak with us for events / venues.